The below artworks are the most important by Jasper Johns - that both overview the major creative periods, and highlight the greatest achievements by the artist. 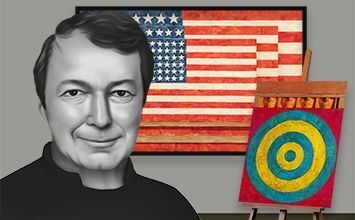 Artwork description & Analysis: This, Johns' first major work, broke from the Abstract Expressionist precedent of non-objective painting with his representation of a recognizable everyday object - the American flag. Johns built the flag from a dynamic surface made up of shreds of newspaper dipped in encaustic - with snippets of text still visible through the wax - rather than oil paint applied to the canvas with a brush. As the molten, pigmented wax cooled, it fixed the scraps of newspaper in visually distinct marks that evoked the gestural brushwork of the Abstract Expressionists of the previous decade. The frozen encaustic embodied Johns' interest in semiotics by quoting the "brushstroke" of the action painters as a symbol for artistic expression, rather than a direct mode of expression, as part of his career-long investigation into "how we see and why we see the way we do." Artwork description & Analysis: In this work, Johns effectively merged painting and sculpture while wittily engaging the viewer with "things which are seen and not looked at." As in Flag, Johns relied upon newspaper and fabric dipped in encaustic to build the intricately textured surface of the painting. However, he also made plaster casts of only the lower half of a female model's face over four successive months, and fixed these out of order in a hinged, wooden box that he attached to the top of the canvas. By incorporating the sculptural elements in the same space as the painting, Johns emphasized the "objecthood" of the painting, as Rauschenberg did in his "combine paintings" of the late 1950s. This merging of mediums reinforced the three-dimensional object-ness of the paintings and was the Neo-Dada response to the recent progression of abstraction away from representation to an ever more reduced imagery that merely reiterated the surface of the canvas. Artwork description & Analysis: For this piece, Johns eschewed the nonverbal symbols of his earlier works, instead relying upon the building blocks of language to draw viewers into a dialogue with the painting. The change of subject matter was occasioned by Johns' desire to move beyond his earlier targets and flags. As he noted, "The flags and targets have colors positioned in a predetermined way. I wanted to find a way to apply color so that the color would be determined by some other method." By focusing on colors and the words that represent them, Johns abstracted each, removing the traditional associations that accompanied them. Rather than hand-paint each letter, Johns used a store-bought stencil - a readymade method by which he could create an image without revealing the trace of the artist's hand. He stenciled the words that denote colors on top and underneath the various layers of paint as he worked. Johns transformed the words into objects by rendering most in colors unrelated to those which they verbally represented - "RED" appears painted in bright orange in the center of the canvas. Johns revealed the dissonance between the words and the colors, shifting their function from designation to a mere assembly of symbols, ripe for reconsideration. Artwork description & Analysis: In this bronze sculpture, Johns intentionally blurs the line between the actual object and its artistic recreation, wherein the handcrafted appearance of the Ballantine Ale cans is only apparent after close inspection. He fashioned the sculpture in response to Abstract Expressionist Willem de Kooning's boast about art dealer Leo Castelli, "you could give [him] two beer cans and he could sell them." Johns accepted the challenge implicit in De Kooning's statement, casting in bronze two cans of his beer of choice, Ballantine Ale, which Leo Castelli promptly sold. The original beer cans were a deep brass-colored metal, which was ideal for casting in bronze to achieve an effective trompe l'oeil effect. However, in contrast to the authentic appearance of the cast cans, he allowed his brushstrokes to remain visible in the painted labels, creating an imperfection visible only upon careful observation. Artwork description & Analysis: Here Johns combined several of the motifs and symbols from his earlier paintings in a constrained palette of gray, black, and white. The upper right-hand corner of the painting contains half of a device circle. In 1959, Johns adopted a technique in which he attached a wooden slat, usually a ruler or canvas stretcher, to the painting to create a compass-drawn circle. The device dragged through the paint formed a target that echoed his earlier target paintings. However, here he interrupted the concentric circles of the target with an imprint of his outstretched hand. The handprint suggests the replacement of the artist's hand with a mechanical device. Artwork description & Analysis: Johns created this expansive, seven by 16 foot painting by joining several canvases together, as well as by adding various found objects to the painted panels. He included techniques that appeared in earlier works, like "brushmarking," the stenciled names of colors, and cast body parts. He also expanded his visual repertoire through his inclusion of elements like silkscreened newspaper pages that discussed the Kremlin in the center of the painting. While Andy Warhol and Robert Rauschenberg used silkscreening as a convenient method of reproducing photographs in paintings without evidence of the artist's hand, Johns fervently painted into and around the screened headlines, reinforcing the idea of the intertwining of artist and device explored in Periscope (Hart Crane) (1962). On the far left side, as an ode to his mentor, he attached a small canvas with the silhouette of Marcel Duchamp so only the back with the stretchers, date, title, and Johns' signature were visible. Above this small canvas, he also attached a vertical cross-section of a chair, with a mold of a leg seated in it, turned upside down. Johns added the found objects to create a painting that "allows things to change" as the lights and viewers shift around the work. This shift in focus illustrated Johns' belief that we all experience the world through multiple fragments viewed in shifting contexts from varying perspectives. Artwork description & Analysis: Johns originally designed this big lithograph as a poster for the Whitney Museum's 1997 retrospective exhibition of his work. The motif of the Savarin coffee can appeared in several of Johns' earlier works, both as a life-size, painted bronze sculpture and as a found object added to a painting. The Savarin image became a signifier for Johns and his oeuvre, which made it an ideal subject for this print. The background of the lithograph portrays brightly colored crosshatched lines, a style which he quoted from one of his most recent paintings. By visually placing the Savarin can directly in front of one of his current paintings, Johns succinctly referenced his entire career through the dialogue between the two items within the print, apropos for the self-promotion related to a career retrospective. Johns later revisited this same lithograph in a series of single edition mono-prints, in which he painted over the original print, adding a renewed sense of the artist's presence and extending the reference to his oeuvre into the 1980s. Artwork description & Analysis: Description: A "catenary" is the curve formed by a rope or chain hanging freely from two fixed points, and is the theme that governs Johns' recent Bridge series of prints, drawings, and paintings (1997). In this particular work, the sensuousness of paint dominates the canvas. Johns applied the monochromatic gray paint in long, loose brushstrokes over a multicolored underpainting, which reveals itself in the gaps between the strokes. He extended the paint beyond the canvas onto the wooden slats on either side of the painting, leaning towards the viewer and integrating the found objects into the painted field. On the left side, Johns attached the pine slat with a hinge at the bottom so it projects out into the viewer's space. Similarly, on the right side, he attached two slats, connected to each other and the canvas with hinges. He secured both sides with a hook and eye, so that they do not fall against the wall, but dangle in the space in front of the painting, evoking the wood and ribbon tumbling block folk toy of the subtitle. First published on 05 Feb 2014. Updated and modified regularly.